Kitchen! Kitchen! : "a delicious quickie saturday brunch"!...at kitchen! kitchen! "a delicious quickie saturday brunch"!...at kitchen! kitchen! of ground turkey lying on the counter and the clock telling me it's 10:00 a.m.
the result was a quick, easy "turkey tartare" for brunch. Easy and delicious, I may add! all the goodness. Great for tacos too! On a hot pan with olive oil brown the meat on medium heat - add the garlic, onions and the rest of the ingrdients except the peas. Season with amazing dry rub and continue cooking for about 15-20 minutes. Add the peas and swish around to combine. Turn off the stove and sprinkle your favorite shredded cheese. 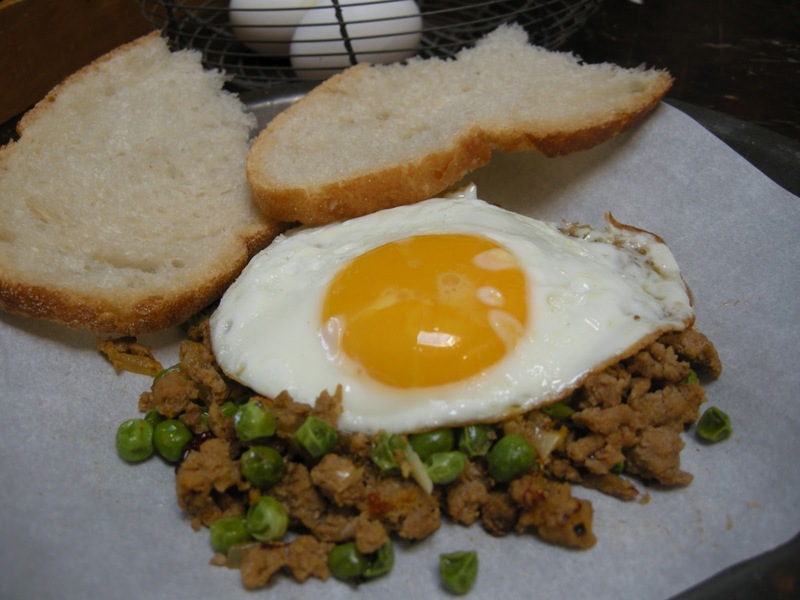 Serve with fried egg on top and some slicess of italian bread or french baguette. It's that quick, easy, and delicious!!! refreshing mango salad....at kitchen! kitchen! mortar & pestle.......at kitchen! kitchen!